Looking for holiday gift ideas for somebody with a limited amount of space in their home? Let Danby help! Shopping for the apartment or condo dweller can be quite the challenge. As experts in the home, we have saved you the time and trouble by preparing this gift guide for those special friends and family in your life. Limited counter space? Unlike other coffee brewing systems, the French Press has a fairly small footprint and is able to produce a premium cup of coffee at a fraction of the cost. The BergHOFF 5 piece French Press set and the SterlingPro 8 Cup Chrome French Press are two of our favourite coffee presses available on the market. If you happen to be in southwestern Ontario area, be sure to check out the Danby’s Factory Outlet store for BergHOFF’s coffee press. A device charging station makes a perfect gift for the tech-lovers in your life and they will really appreciate the space savings these devices offer. 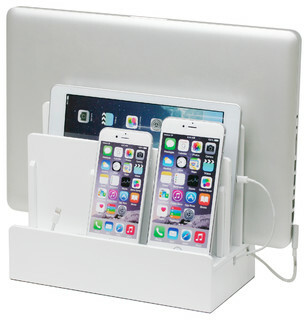 Houzz.com showcases a variety of these charging stations that will help organize and free up even the most disarray workspace. Not every apartment has the space to fit a full size dishwasher, laundry machine or a secondary refrigerator however, Danby has a great solution for this problem that would put you at the top of Santa’s good list. Dishwashers: Danby offers both countertop and portable dishwashers that are perfect for smaller spaces because let’s face it, those dishes aren’t going to wash itself. Washing Machine: Our portable washing machines make a perfect companion for those who are very limited in space and are not able to install full size laundry units. This appliance is a crowd-pleaser. Give the gift of a delicious grilled dinner this holiday season with one of these indoor grills. Apartment dwellers may not have the patio space for their own full size barbecue and that is why they would really appreciate this alternative grilling solution. Of course you could always settle with the ‘soap and lotion’ combo or even better the classic re-gifted candle set but what if you gave the gift of easier apartment living? It would be much more meaningful to your friend or family member this holiday season (not to mention you avoid the risk of ending up on their naughty list).